3/16x7/8 Anchor Size. Pan Head Screw Type. 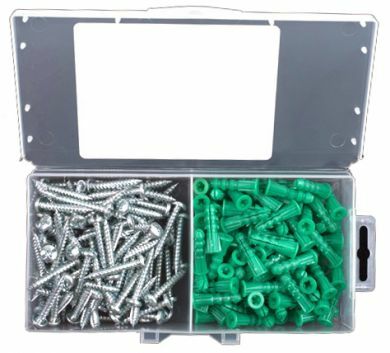 8x1 Screw Size. All kits contain an equal amount of Ribbed Plastic Anchors. Contains and equal amount of Pan head COMBO screws. Carbide Tip Masonry Drill included. 100/bx. Clear plastic reusable box.